In this part of my Android tutorial we cover how to use Intent Services, Broadcasts, Broadcast Receivers, Intent Filters and how to download, save and read files. 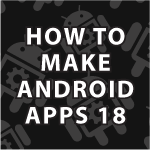 I did my best to keep all of the code separated so that you can easily copy and paste out the functionality you need with your Android apps. All of the code follows the video with a ton of comments.